This book is the second of the Lady Helen trilogy. It combines the high society of 19th century England with supernatural underworld. Being the second book in a series of three, I found it quite confusing as to what the reader was expected to already know characters' backgrounds, relevance of events, etc. It is set in Brighton, in July 1812, in the time known as the Regency. The protagonist is Lady Helen Wrexhall and she is continuing her Reclaimer training to prepare for her duties as a fully-fledged member of the Dark Days Club. Her mentor, Lord Carlston, believes that a Grand Deceiver has arrived in England, and he needs to prepare Helen immediately to fight it. Helen is keen to complete her training, but is torn between her loyalty to Carlston and the orders of the Home Office (government), who want to use her skills and talents for their own agenda. Meanwhile, the Duke of Seburn is determined to protect her at all costs. Helen must make a difficult decision between duty and devotion. The story of this book seems to be well-researched and authentic. It has attention to detail and possibly would be enjoyed by people who enjoy historical fiction and fantasy, although to anyone interested in this book I would recommend reading the first book first. This book wouldn't be one I would choose myself and the front cover isn't particularly inspiring. I found not starting at the beginning of the series to be quite confusing and maybe if I had I would have more sympathy and understanding towards the main character. The Dark Days Pact is a very page gripping type of book. I did not get to finish the book, however, from what I have read, I have really enjoyed the book. I like the way it still uses the language that woud have been used in 1812, but not to the extent that you cannot understand, as it made me think about what life was like during that time. The fact that Lady Helen has to 'dress like a man' and 'act like a man' of her time to do the Reclaimer training shows how little significance and status women had during that time. This intrigued me as I am very interested and for women's rights. Lastly, I really like the adventure of the novel and think it is welcoming to many different people's style and gender. I liked this book because of its unique and original ideas, the parts that I liked the most are when Helen receives new powers and also when she is learning to become a man as part of training as she has to observe a lot of other men dicretely to master the art of it. Alison Goodman's history in this book is surprisingly detailed and we learn a lot about the times in Brighton in the year 1812. This book starts in Brighton July 1812 when Lady Helen Wrexhall is spending the summer season as a refuge in Brighton, this is where she will carry on with her Reclaimer training and prepare for her duties as a fully fledged member of The Dark Days Club and after this her mentor, Lord Carlston, believes that a Grand Deceiver has arrived in England, and there is no time to lose in preparing Helen to fight it. As she rushes to finish her training, Helen finds herself torn between betraying those around her or breaking her oath to The Dark Days club. Meanwhile, the Duke of Selburn seems determined to try and protect her, he is determined to marry her even though this is against the oath she had made, irrespective of the risk he gives himself. When so much is on the line, Helen must make an intense choice between responsibility and devotion. From time to time I don't understand little snippets because I haven't read the first book in the Lady Helen trilogy, I also think that the book was aimed at 13/14 year olds which is why I didn't enjoy it to the extent of naming it one of my favourite books but otherwise I really recommend this book for lovers of Harry Potter, Percy Jackson etc. Lady Helen Wrexhall is the courteous daughter of an Earl and she, like her late father, is a Reclaimer: one of a few dexterous humans with the supernatural skill to fight hellish creatures called Deceivers. Not only is she the only female Reclaimer, Lady Helen also learns that she is a Direct Inheritor. In Reclaimer beliefs, the appearance of a Direct Inheritor means that a Grand Deceiver, an equally powerful and terrible enemy, has also arrived. The secret society of Reclaimers is known as the Dark Days Club and Lady Helen is their newest member. Overlooked by the handsome Lord Carlston, the best Reclaimer but whose reputation is tarnished by the disappearance of his wife, Helen continues her lessons in the art of slaying demons. Her first mission as a fully inducted member is to recover a journal which not only contains alchemical mysteries and powerful magic, but also secrets including the fate of Lady Helen's parents, a dark truth about the Dark Days Club and, a way to save a Reclaimer from becoming deranged and after killing so many Deceivers. Alison Goodman is a brilliant writer. She is very accurate with details and I could tell very clearly that it was set in the Regency Era. It was the perfect balance of romance, mystery, danger, gender-roles and plot twists. There were some action scenes but despite the finite amount, they were very detailed. The plot was a little slow-paced but that was only because there was a lot of detail and everything was described properly. I liked finding out more about Lord Carlston and his past but I particularly loved that Helen was caught between her upbringing as a noblewoman and her duties as a Reclaimer. As the only female Reclaimer in the Dark Days Club, the men saw her as weak despite her participation and power but she remained strong-willed and determined. The way she stood up for herself, especially at the end, was amazing. Helen was confined by society's rules for women but she never hid behind a man, and even though she dressed like a man for disguise and cut her hair, Helen was a resilient girl. Overall I enjoyed the book throughout and I can't wait for the next book in this series to be released! Personally, I knew nothing about the Regency Era before I read this book but that didn't stop me from enjoying it, therefore I would wholeheartedly recommend this book to you even if you know nothing about the Era in which it was set. 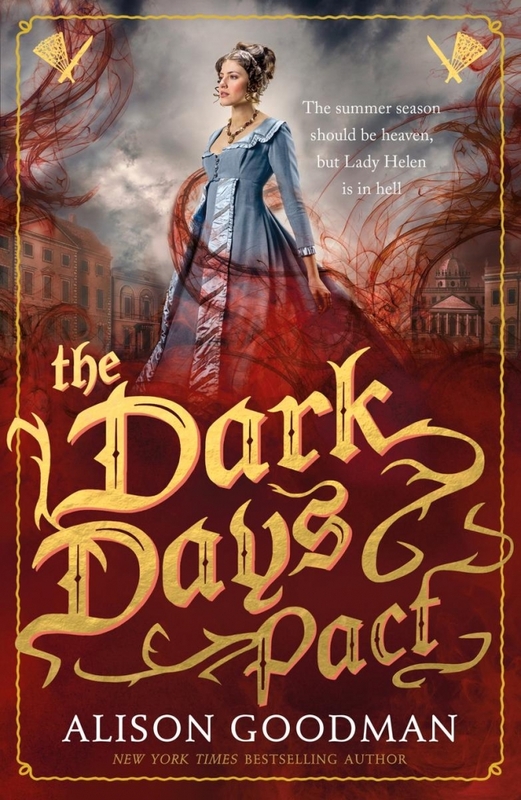 I thoroughly enjoyed reading the 'The Dark Days Pact'.  I found it to be interesting, thrilling and amusing. I enjoyed Lad Helen's sense of intelligence as well as her witty personality. The information in this book, regarding its authenticity, I believe is as realistic as any book written in the past can be. The author clearly made sure the information that she was writing was correct. Even though it didn't make me want to learn more about history it did make me want to read more books like it. I would definitely read more books by the author; Alison Goodman and I would also recommend this book to others! Although this was an interesting book I sadly did not like it. If you didn'tt enjoy this book-why? : I didn't enjoy this book because I wasn't as interested as I was with the other books. I wasn't directly drawn in as I would have hoped in the beginning. I'm not particularly interested in the history either so I found it hard to immerse myself in the story because I wasn't interested as much as I was with the other books and their history. Was it the story you didn't like? : I liked the story and the characters it was a modern idea set in a historical background so the story was good I did like the parts in the book describing Helen training learning about the weapons she uses. And I liked it when Helen goes out disguised as a man because of the shocking events she gets herself in, but It was just in some parts of the book the fast pace was missing and like I said I wasn't drawn into the story from the first page so I became disinterested and bored sometimes whilst reading the story. What did you think about the history in the book? : Like I said I liked the story but there wasn'tenough history in the book as I would have liked, I think I needed more facts and more figures to engage me. Tell me about the lives some of the people were living such as the poverty found compared to the lavish lives of the lords and ladies. I wanted to find out more about this period maybe so I can see why the writer took such an interest in Brighton, July 1812. But there was some history within the story describing the places in which Helen moved to and from. Is there anything else you would like to say about this book? : Like I said sadly I didn't like the book as I wasn't pulled in and found that the lack of fast pace and history in the book made me become disinterested. But just because I didn't like it doesn't mean it wasn't good I found that I liked the story something unexpected and fresh as I liked the ideas and the trouble Helen got into because of the dark days club and her disguise I also liked the description of some of the places in the book showing how different it is to now a days but however I would have liked to have seen some more history and maybe some description of poverty within the book!